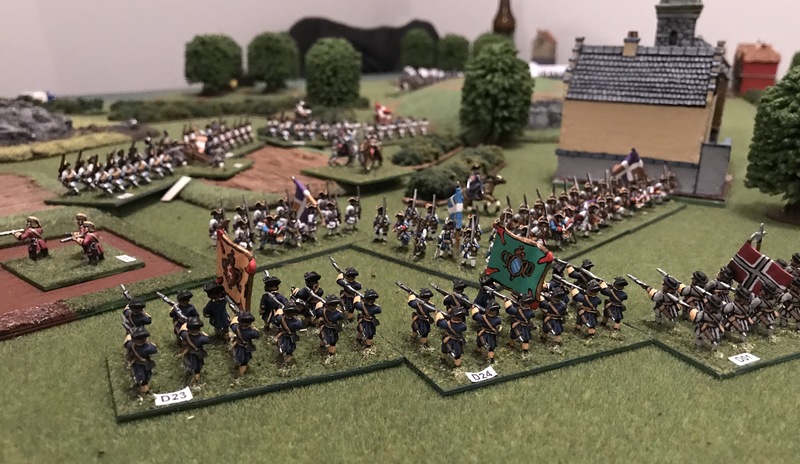 Most of my Volley & Bayonet gaming is in 6mm, yet one of the great aspects of the rules is the they work well irrespective of the scale of the miniatures. This allows players to build armies using the scale they prefer. 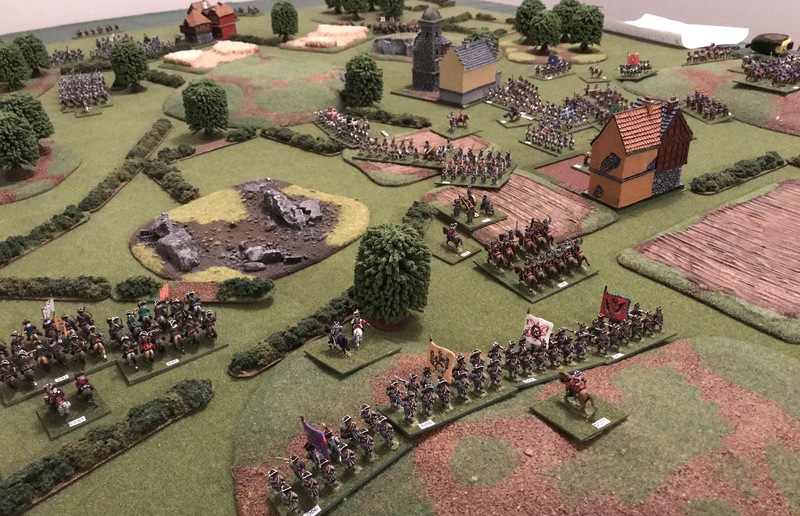 Personally, while I see many advantages of 6mm I’m more than happy to join games using figures ranging from 2mm to 25mm. 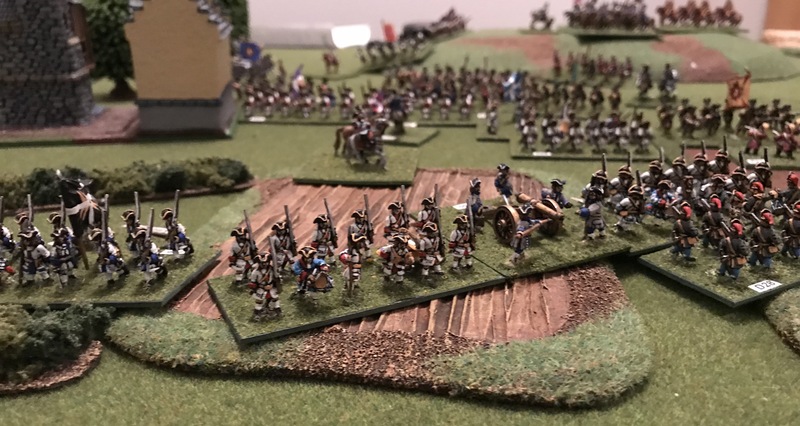 So while last week it was an excellent 6mm American Civil War game last night we changed scales. 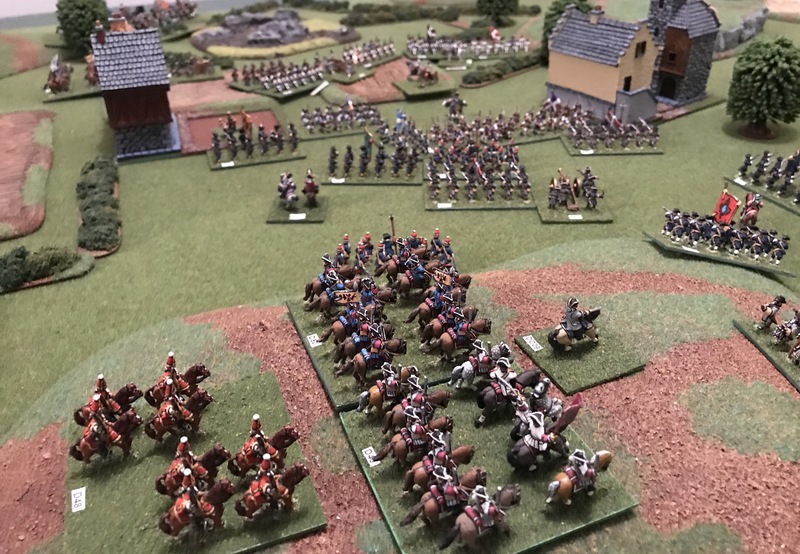 Adrian agreed to organise a Marlburian game using his 15mm figures and terrain, while Robin provided the venue. 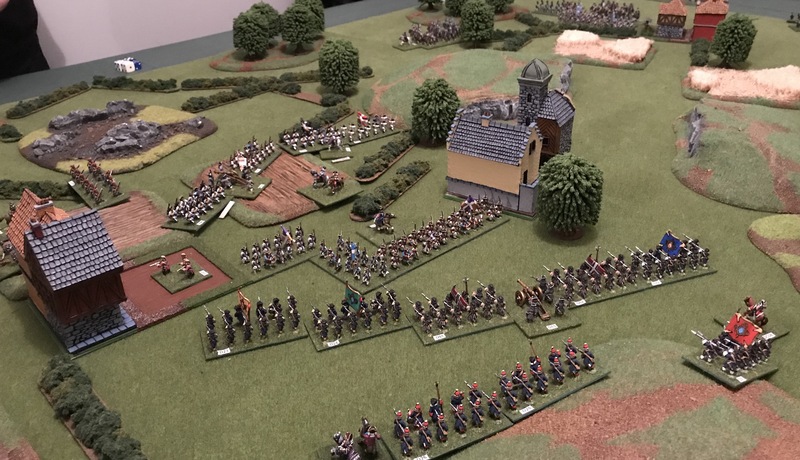 The scenario found a portion of the French army deployed forward and assaulted by the Prussian and Dutch while additional French and allied formations marched to their support. Interestingly there were several choke points, in the form of areas of broken ground, ravines and villages which reduced movement options. It is however worth noting that in this game the fields and hedges are visual enhancements and do not impact game play. Not having the rosters or scenario details to hand I won’t try and provide a full summary of the game, but rather I’ll provide a few photos and a brief description. 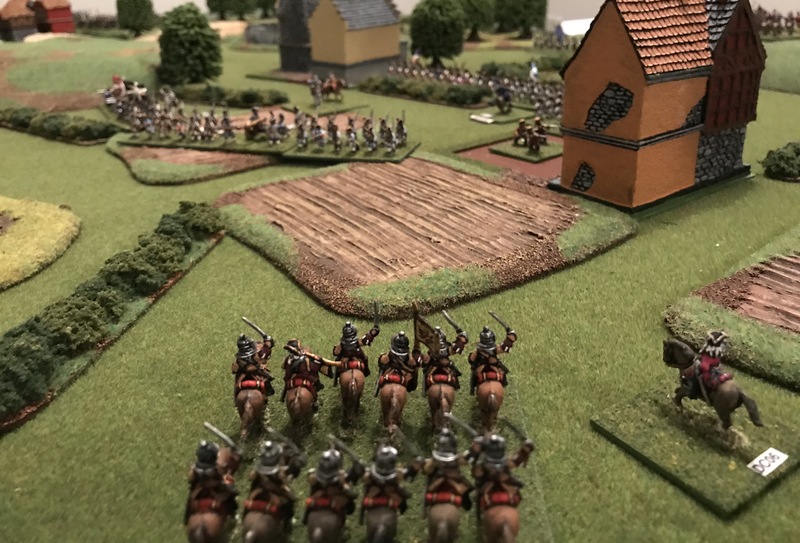 Above, a view from the Allied right as Prussian and Dutch infantry advance on the French defenders deployed in and around two towns. In the top left Allied cavalry can be seen approaching the French on the other side of the defensive positions. The French would soon suffer attacks from two directions. Below, another view of the French. The attack on this portion of the French defences would occur first, but the French were still able to go stationary. Above and below, a view of the Allies on the opposite side. The attack here would be initially smaller but involved infantry, artillery and cavalry. Later additional infantry and cavalry would deploy to reinforce the attacks. Below, a more general view. Above and below, two views of the attacks by the Allied right wing, with the Dutch advancing. In the preceding turns a portion of the French line had been driven back. 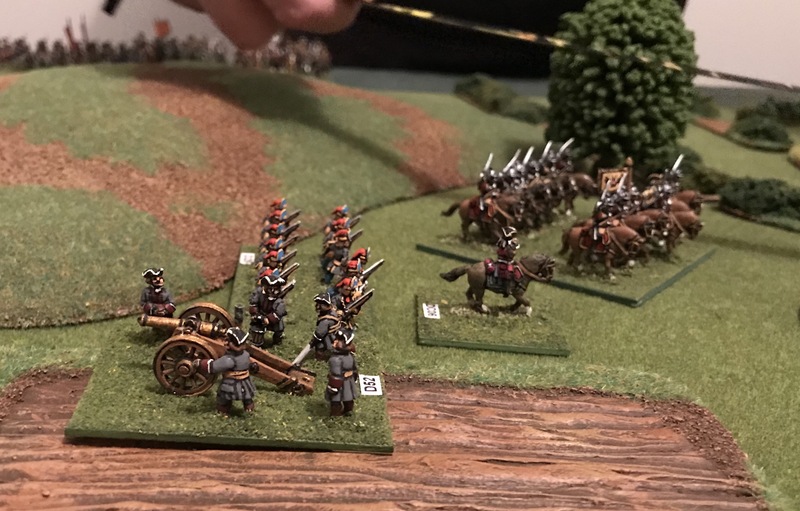 The Prussians press their advantage with converged grenadiers now attacking. The allied attack was slowly developing from the left in an attempt to progressively unravel the French line. Allied artillery fire at supporting French formations. 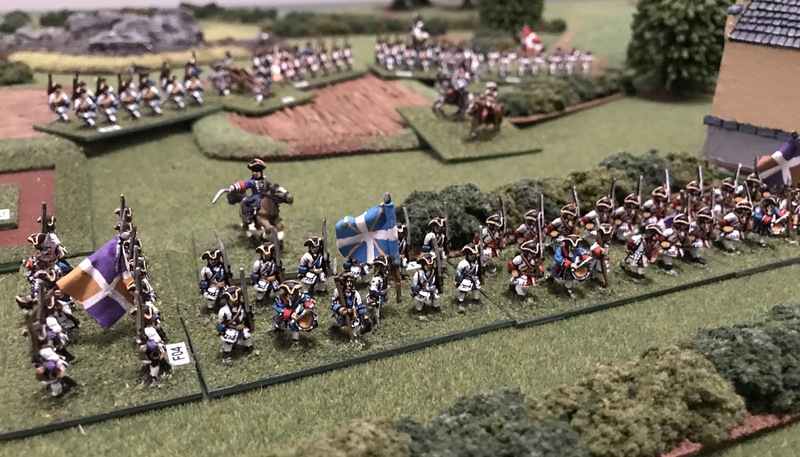 Meanwhile French reinforcements, such as those below, are moving to reinforce the beleaguered French. Allied reinforcements, shown below, are also now deployed. Several dragoon formations have formed up on the high ground on the Allied right. From here they can counter French cavalry or support the main infantry attack. On the Allied left the attack was also well underway. 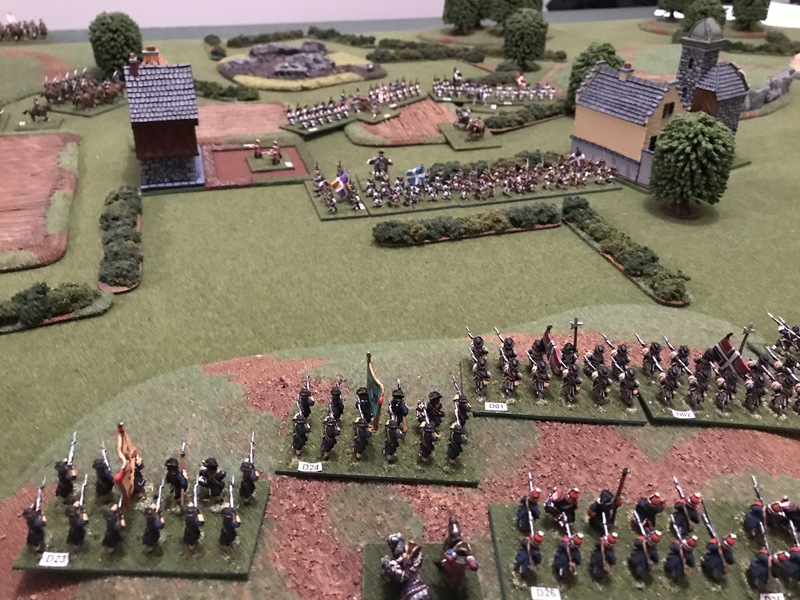 However, an area of broken ground caused considerable disruption and Allied infantry were often sent in piecemeal against solid French infantry. While some gains were made the French artillery was crucial in driving the attacks back. The Allied right was the focus of French counterattacks as here Allied forces threatened to break the French position. To counter this threat French reinforcements threatened the extreme Allied right. A ravine and town, secured by Allied infantry, channeled the French cavalry and disrupted the planned attack. Instead Bavarian attempted to storm the town but were repulsed with heavy casualties. The repulse of these attacks were the final turning point. 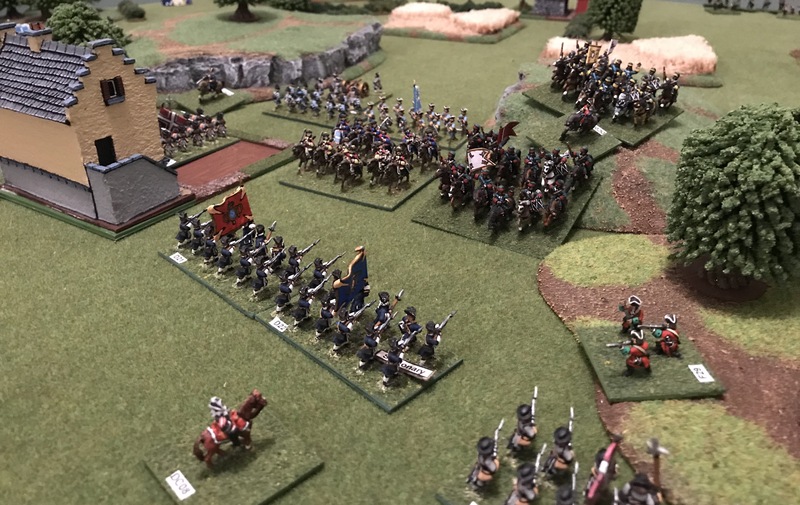 Now, the infantry and cavalry of the Allied right, supported by attacks by the Allied left, were launched in a series of coordinated attacks on the isolated French infantry. Despite fighting valiantly the French infantry, now attacked from several directions, were soon in full rout. 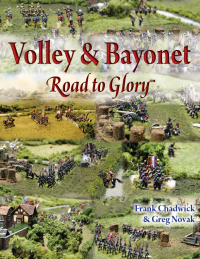 Another fascinating Volley & Bayonet game. Indeed. The Lace wars do look good when you can see all the lace! Great looking game Keith. 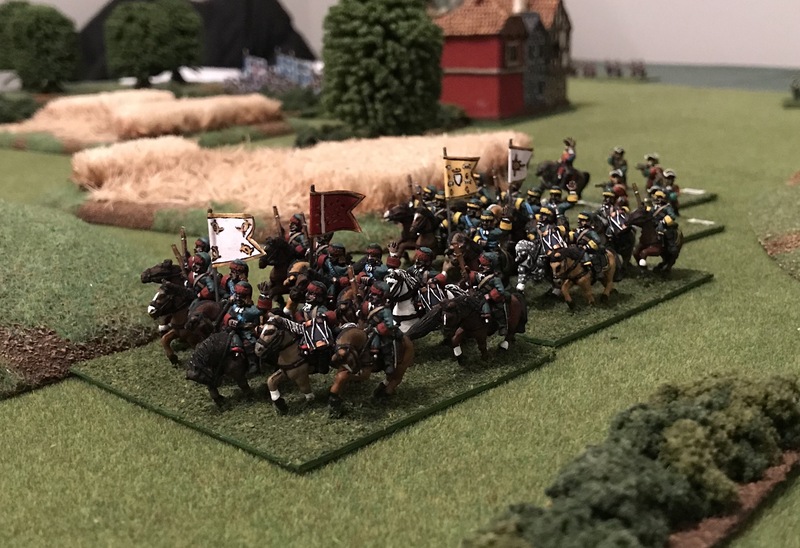 A Marlburian Imperial army in 25mm was my first ever war gaming army. Based for WRG’s H&M rules it was totally made up of Wargmes Foundry figures. Appreciate the comments & interest. 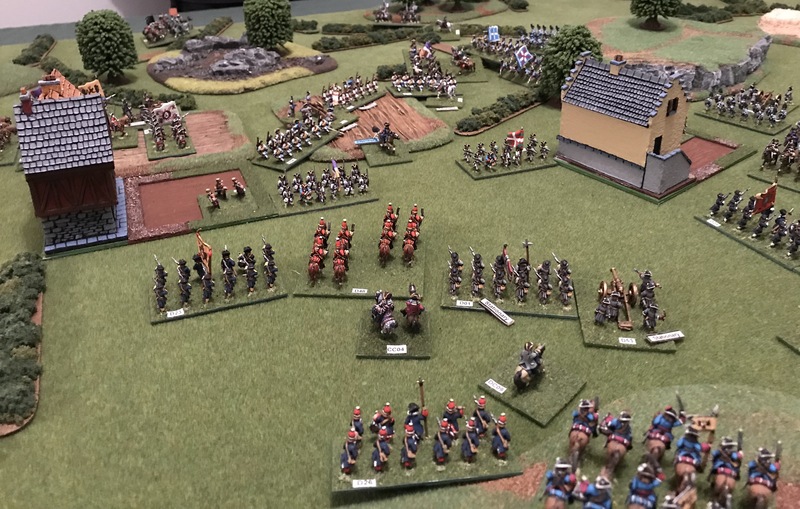 Adrian is a good painter which results in great looking figures and a great battlefield especially when combined with a well presented battlefield.